Just For The Fit Of It is a new interactive, red carpet affair now in it's second of seven cities and we would like to personally invite you December 21st to the competition style charity event! 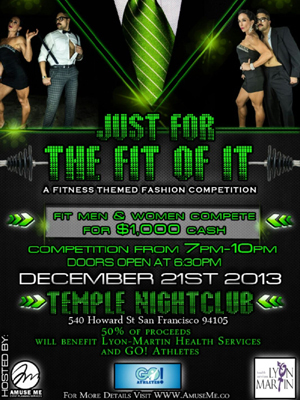 A fitness themed fashion showcase raising awareness about different health issues in 7 U.S. cities across the country. 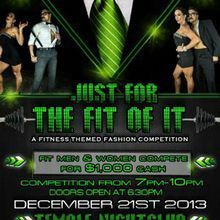 We use fitness and athletic men and women for our runway competition and they compete for $1000 cash prize! We donate a portion of our proceeds to local and national health related charities. Our 2013 San Francisco health concern is in regards to the disparities in LGBT healthcare and sports. Our two beneficiaries for the San Francisco event are Lyon-Martin Health Services and GO! Athletes. Each organization will receive 25% of the proceeds raised from the event. Our events also showcase up-and-coming designers and local retailers and give the "power to the people" as our guests rate and select their favorite, fit male and female contestants. Guests can also shop and receive special offers on products and services from our partnering merchandisers at their mini trunk show booths. Mix our catwalk competition with red carpet photo ops, drinks, auction items, giveaways and fun, stylish company and you've got yourself a good time while benefiting good causes!